A big hello to Gloria, hope you're having a great summer. I've been working on a story about some kids who feel like no one sees them, like they don't even exist. Do any of you guys ever feel like that? Georgina, I'm glad you like the Ghostville Elementary series. It was fun to write (and a little creepy). Mariah, welcome to the site. Let me know what you like and don't like about the site. The Swamp Club is getting ready to undergo a bit of a facelift and the addition of a new section. Say hi to your sister for me. Cool, cool, cool and I'm not talking about the weather. The Bailey School Kids are coming to the big stage. The first date will be in Manhattan at 10:30 at the Town Hall. The second is the next day in Hempstead at the Adams Playshouse (Hofstra University) at 10:30. Other New York, New Jersey, and Pennsylania shows are listed HERE. Caroline, I've asked if it will be touring other parts of the country this year, but I haven't heard back yet. If you want it to come to your city, get your parents to email pdwyer@twusa.org to ask Patrick. I plan to attend as many performances as possible, so maybe I'll see you there! Sarah, I do love horses. 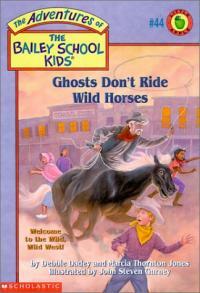 That's why I enjoyed writing Ghosts Don't Ride Wild Horses and Unicorns Don't Give Sleigh Rides. Your idea was funny! Hi guys! I just got back from Bermuda! It is so pretty there. It was just my husband and me, so we relaxed on the beach. I got to read a lot and wrote some too. Imagine looking out your window and seeing nothing but ocean, it was totally cool! Have you read any good books yet this summer? One of my favorites is Ghouls Don't Scoop Ice Cream. In fact, ice cream sounds really good. I think I'll have a snack after I write this! Hi to Lluvia and Destany Maria. Destany, you sound like an awesome sister. (I always wanted a sister!) Who knows, your names might just show up in a book-you never know! Gabby and Robin, thanks for your fun idea. It'd be great to write, I think. Brittany, congrats on your report card and good luck in fifth grade. I used to get in trouble for talking too much in fifth grade, so watch out. A big summer hello to John and Dijana, hope you're enjoying yourself. Evelyn, I do like books that are just a teeny bit scary, but I also like funny books. What about you? I think people should read what they like and also write what they like. Sabrina, when I was a kid I used to read a lot, play baseball in my backyard, water ski, and bike ride. I had two brothers and we managed to have a lot of fun. Hayley, personal information is just saying stuff about what school you go to or your last name. We don't put that on this site because we believe in protecting kids from any bad guys on the Internet. I went to Belgium quite a few years ago. I visited a school in Belgium and also went to Brugge (I think that's how you spelled your canal city. It was cool). Danielle, hope you keep having a great time with your cousins and have fun writing.